The kitchen is the most indispensable part of any home, and a sink is the most vital part of any kitchen. But how do you select the best kitchen sink? It is a hassle to select a kitchen sink that looks good and provides optimal functionality. What adds to the trouble is the next step of choosing a faucet, soap dispenser, and so on to match with the sink both in looks and performance. Wouldn’t it be great if you could buy an all-in-one kitchen sink? Glacier Bay offers the VT3322B1, one of the best all-in-one sinks for your kitchen. You won’t have to coordinate and buy half a dozen different products anymore. It is one of the most recognized brands owned by Home Depot Inc., USA, so you can rest assured about getting a high-quality sink. Now that we have discussed its features, it’s time to delve into the intricate details of the Glacier Bay Kitchen Sink, model VT3322B1. We used this sink extensively for a couple of days to get a better understanding of everything there is to like about it. Read on to know some of the win-win characteristics of this product that makes it one of the best all-in-one kitchen sinks available in the market. The sink is conveniently split into two parts to allow effective multitasking. We especially like the sound insulation to reduce water noise while working in the kitchen. The sink features one large bowl, providing abundant space to prepare food and clean dishes. You will appreciate the thoughtful placement of the included faucet and soap dispenser slightly to the right. The spout design meets industry standards with a height of 6.3 inches. The four pre-drilled holes to hold the soap dispenser and faucet deserve a special mention. When it comes to buying an all-in-one sink, Glacier Bay VT3322B1 is one of the best products out there. 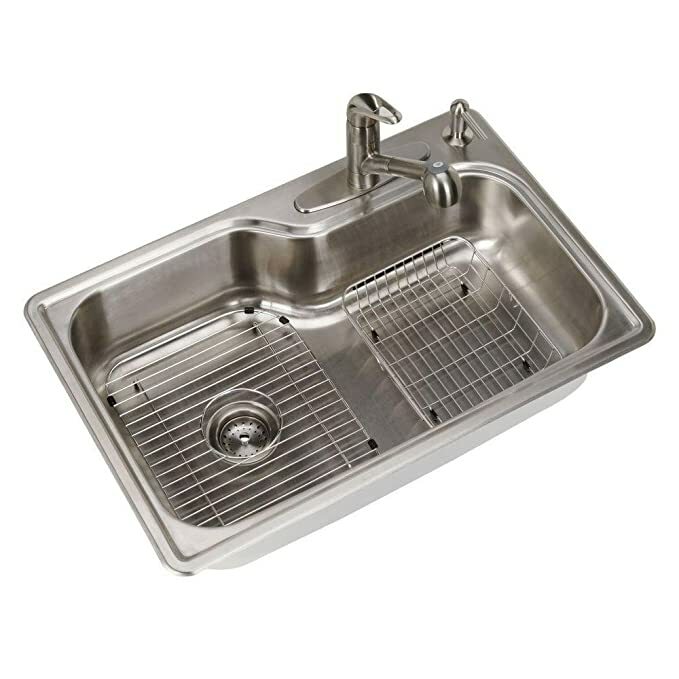 You get a large sink, faucet, soap dispenser, strainer basket, knock out holes, drain, bottom grids, and mounting hardware. It indeed eliminates the trouble of buying multiple matching products that can be assembled into your kitchen sink. We love how convenient and time-saving a wide array of kitchen activities become while using this masterpiece of a kitchen sink. The included pull-down faucet and soap dispenser are great and make life in the kitchen a lot easier. One of the essential advantages of buying this kitchen sink is its easy installation. For all DIY-installers like us, installing this sink is a piece of cake! The instructions/assembly guide contains simple step-wise instructions and easy-to-follow pictures to ensure you do not have to spend money on hiring a plumber. The brushed finish makes cleaning this sink very simple. We appreciate how easy it was to wipe the sink and faucet with standard cleaning agents and a damp cloth. We like the durable 18-gauge stainless steel material used in this kitchen sink. It is one of those products that will not add to your worries. It weighs about 15 pounds, making it evident that it is not made from flimsy materials like plastic. With this kitchen sink from Glacier Bay, you get long-lasting use. The brushed finish and sturdy construction can easily withstand the regular wear and tear sinks endured in any kitchen. A kitchen sink can either uplift the overall look and functionality of your kitchen or take it down the drain. Open kitchens are becoming more popular, meaning that your kitchen plumbing fixtures may be visible from the living room. Installing a kitchen sink that looks good is of utmost importance now! Looks are not everything when it comes to a kitchen sink. You will want to install a sink that saves your time and effort through the many kitchen tasks. We are sure that the Glacier Bay kitchen sink we have recommended will do justice to the challenge.